Unlike a jet spray washer that cleans parts by flooding them with a lukewarm chemical solution relying on high detergent concentration as its primary cleaning mechanism, StingRay's Power Wash Process is different. The Power Wash Process utilizes a low concentration of detergent and blasts parts with hydraulic impact force and high-temperature as its primary cleaning mechanisms. A low concentration of cleaning chemical enables the cleaning solution to last longer before supersaturation occurs and requires disposal. Using a low chemical concentration with Power Wash also increases the rinse effectiveness. Less chemical means easier rinsing, saving fresh water, and shortening the rinse cycle time. Another key factor that differentiates the StingRay Power Washing Process from Jet Spray Washing is its Oscillating Solution Delivery System that is non-synchronous to the rotation of the turntable. This oscillating system assures that the blasted solution reaches all areas of the wash load that are otherwise blinded by stationary manifolds used in jet spray washers. The nozzles in Jet Spray Washers aim at the center of the turntable so that a single strike angle hits the same surfaces throughout the wash cycle. By comparison, at the heart of every StingRay Parts Washer lies the patented, non-synchronized, oscillating spray manifold system that blasts parts from a different angle each time the part passes on the rotating turntable, providing thousands of strike angles during each wash cycle. Jet Spray Washers operate at low flow and moderate pressure with an average of 50 PSI at 2.8 GPM per nozzle and velocities under 90 ft/sec. Difficult soils and shorter wash-cycle requirements demand higher impact pressure and higher Power Density* (amount of cleaning energy in horsepower per cubic foot of cabinet volume). StingRay offers a wide selection of pumps to provide a Power Washer equipped with enough power to do the job. (Compare StingRay Washers to Other Manufacturer's Equipment) For example, the StingRay model 6075 (60” diameter turntable with 75” work height) equipped with a 70 hp Duplex pump system, commonly used for tough soil removal, has a Power Density of .57 (hp/ft³). This is enough power to remove carbon deposits from cylinder heads. (Note: The StingRay 70 hp Duplex pump blast the parts at 190 PSI and 431 GPM delivering more than 3,500 pounds of hot solution every minute. Important Distinction: Jet Spray Washer performance data is typically provided from the pump curves, provided by the pump manufacturer, and does not account for the substantial suction, discharge and transitional losses that occur in the plumbing system. Losses that consume energy, reduce the power available for parts washing, and greatly reduce the ability to clean parts. 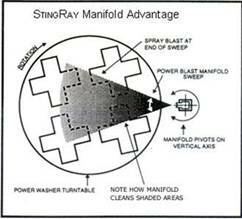 StingRay pump performance data is accurately measured and reported at the parts washer’s nozzle tips. Overall, the Power Wash Process utilized by all StingRay Parts Washers is superior to jet spray washing for faster, more thorough parts cleaning cycles while minimizing cleaning chemical use and waste generation. The Oscillating Solution Delivery System, combined with high efficiency pumping systems and high-output heating systems, delivers faster cleaning cycles and more thorough cleaning. Plus, StingRay Parts Washers are environmentally safe with a closed-loop, zero discharge design that meets EPA and OSHA regulations. StingRay truly provides the complete solution for your cleaning needs: Parts Washer, Detergent, and Technical Support. Power Blast Manifold - why is this a better cleaning method? Power Density - what is it and why is it important?